Give us a little info about yourself! Used to be fairly active in here. Just got back into collecting again. Looking forward to talking with many of you. I will be updating a trade and want list soon. I collect Hurricanes, Detroit Redwings and Jeff Skinner. Also in non hockey I collect some baseball and football. Living in the Atlanta area now so I’m a big fan of Ronald Acuna Jr.
Hockey- Jeff Skinner, Steve Yzerman, Chris Chelios,Rod Brind'amour, Pavel Bure, Teemu Selanne, Ray Whitney, Gordie Howe, Redwings and Hurricanes. Baseball- Ronald Acura Jr, Bryce Harper, Al Kaline, Justin Verlander, Ender Inciarte, Detroit Tiger and Atlanta Braves. welcome back trading has been slow around here . We can use more traders. 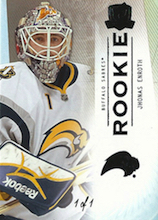 Let me know if you have any cards from my Enroth Card Wantlist to help my collection! Thanks!